Wetland of international importance, the Ria Formosa is a maze of canals, islands, marshes and barrier islands, stretching 60kms along the Algarve coast, between the beaches of Manta Rota and Garrão. This diversity of ecosystems attracts a varied fauna that includes numerous species of birds. One of the rarest is the "galinha-sultana (sultan hen)", symbol of the Natural Park, and a type of bird that you can't find anywhere else in the country. If you want to admire this bird of gorgeous plumage and know everything about the protected area, begin your visit by the Centro de Educação Ambiental de Marim (Environmental Education Center of Marim), which will show you the most suitable hiking trails and observatories where to hide to enjoy the day-to-day of the various species. The park also organizes tours in a traditional boat formerly used in tuna fisheries. Before going on a walk, see the protected area for more information about the courses, including their conservation status. The Natural Park of Ria Formosa can be visited throughout the year, the best time to visit can vary according to your objectives. If your visit is related with cultural values, any time of year is appropriate, although you should avoid the high Summer season if you're seeking peace and tranquility. If you're seeking contact with the nature, in particular the fauna, then the fall and winter are the preferred times. Most of the existing species in Ria Formosa are hardly observable, except for the birds, their flight and their colors. 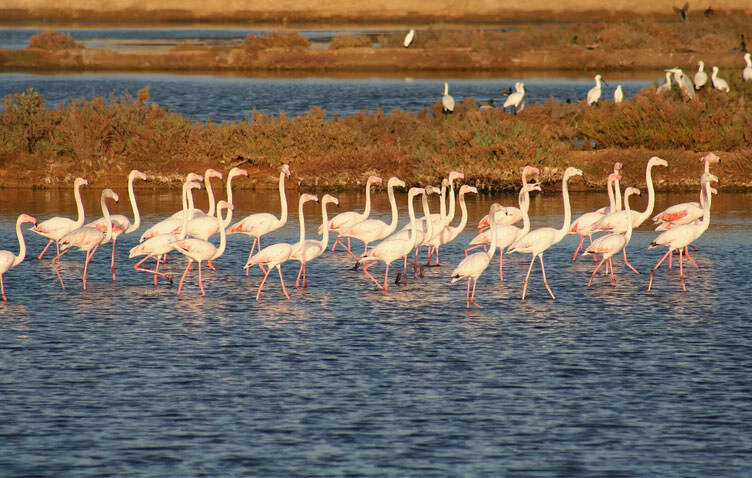 The Ria Formosa is of crucial importance to most avifauna, given that is a resting area for migratory birds and a wintering place for a considerable number of waterfowl. The natural park is also a nesting site for the birds arriving in the spring, or that make Ria Formosa their permanent habitat. One of the nicest species that can be found here, is the Portuguese water dog. This is a breed of dogs that for long, helped the fishermen in their toil, diving and catching fish that got trapped in nets. The whole area of the park is of great natural interest, cultural and landscape. 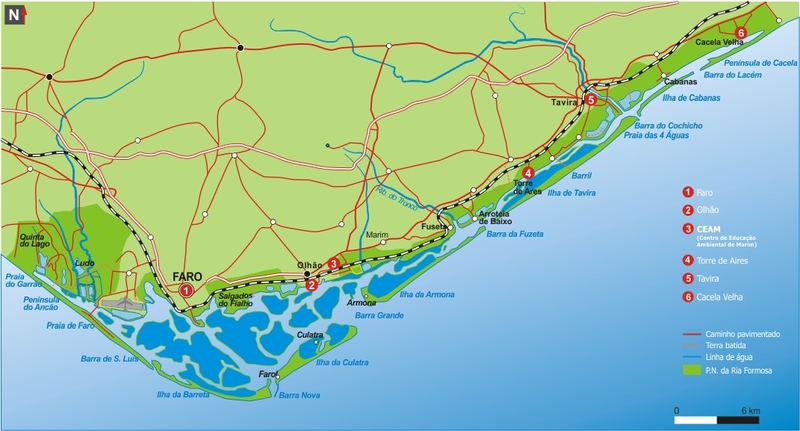 The following are some of the main points of interest in the area of the Park, from Vila Real de Santo António to Loulé. Besides fishing, salt extraction and harvesting of shellfish and bivalves, there are the traditional activities of populations of Ria that with wisdom and art, created gastronomic delicacies such as fish soup or rice razor clam, which you can enjoy peacefully in some restaurants on the seafront. If you like sun and sea, you will find the paradise in the Ria Formosa Islands. From East to West, a succession of beautiful places like Faro Islands, Barreta, Culatra, Armona and Tavira, with long sand coasts. To cap the tour, visit Cacela Velha, a white village with a remarkable heritage. Climb the fortress, and look around. The landscape that blends the blues of the lagoon, sea and sky, is breathtaking.